In the three months since its release, Avengers: Infinity War has become a staple of pop culture dialogue. Thanos, his snap, and the jokes are already integrated into our everyday lives. So you’re probably wondering, is there really more we can learn about this massively successful movie? It turns out the answer is a very big yes. Avengers: Infinity War is out on digital download today with the physical disc just two weeks behind on August 14. 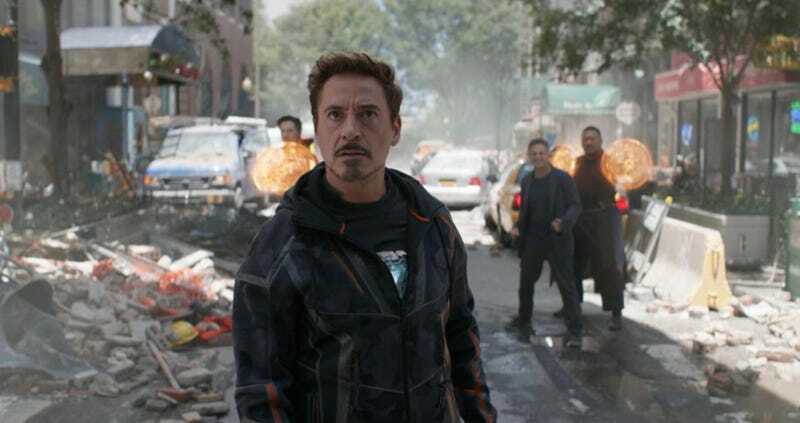 It comes with about 30 minutes of featurettes, 10 minutes of deleted scenes, a gag reel, and a commentary track featuring directors Joe and Anthony Russo along with writers Christopher Markus and Stephen McFeely. And while we obviously recommend you explore all of it for yourself, we took a deep dive and came back with a tonne of new facts and behind-the-scenes nuggets about the making of this epic film. 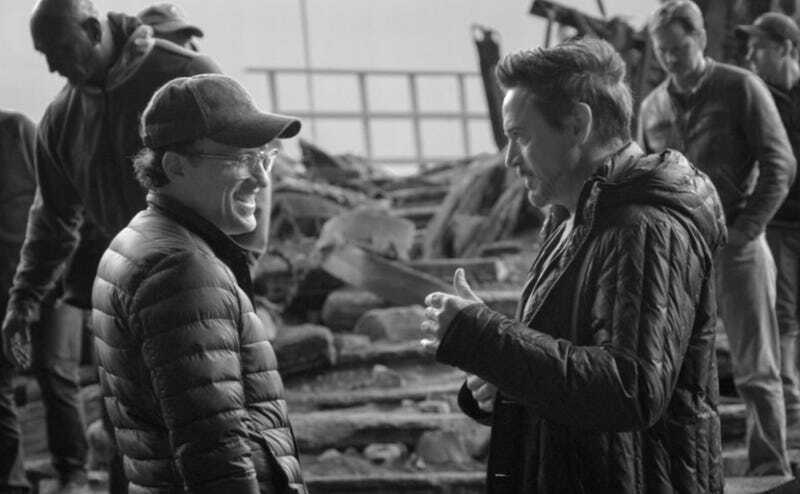 Anthony Russo and Robert Downey Jr. on the set of Avengers: Infinity War. • About 6,000 people worked on Infinity War and the film has about 3,000 shots in it. Of those, about 2,900 have visual effects. • Thor director Kenneth Branagh does the voice of the distress call at the beginning of the film. • Markus and McFeely began writing the script for Infinity War in January 2016, which was before a script for Thor: Ragnarok existed. So the idea to start this film where that film ended came much later in the process. There were a lot of different ideas of how to begin Infinity War before that. • The fact the Tesseract, the first Infinity Stone revealed in the MCU and so important to Phase One, is so easily destroyed in the first scene of this movie was very purposefully done to set the stakes. Same with the deaths of Loki and Heimdall. • The directors confirmed that several people, including Valkyrie, escaped the Asgardian ship before the film begins. They wouldn’t confirm if Ragnarok’s revolutionary Korg was among them, though. • Wong’s line “I wouldn’t say no to a tuna melt” was in every single draft of the script. Getting the story started as quickly as possible was crucial to the film. • The scene of Tony and Pepper talking in the park was originally longer, and Happy Hogan, played by Jon Favreau, was in it. He drove in on a golf cart to yell at them because he’s trying to keep paparazzi away. The full scene is on the home release. • Some early drafts of the script included a scene of Thanos collecting the Power Stone from Xandar, planet of the Nova Corps. seen in the first Guardians of the Galaxy movie. Originally, Nebula was going to encounter Thanos there, until the filmmakers decided audiences didn’t need to see Thanos getting every single stone, since it would be repetitive and besides, his victory was inevitable. So Gamora met her father figure on Knowhere instead. • There are a lot of Raiders of the Lost Ark winks in the movie, the first being the moment Maw’s hand is burned when he tries to grab the Time Stone off Doctor Strange. Thor meeting the Guardians was shot early on in production. • Neither of the directors or the writers is sure exactly how much time passes from the events at the beginning of the movie to the end, but they guess about two days. • The scenes with Thor and the Guardians of the Galaxy were shot early on and had about 15 minutes of additional jokes. • Vision and Scarlet Witch’s scenes were shot on location in Edinburgh, Scotland because they felt it was a place that could go from romantic to scary very quickly. • Some drafts of the film had backstories for members of the Black Order, but they all got cut. The only remnant is that Proxima Midnight and Corvus Glaive, believed to be married, are together throughout the movie. • Everyone wanted Steve Rogers’ entrance to be as late in the film as possible. At one point, he didn’t even show up until Thanos had arrived in Wakanda. But that was deemed too crazy and they settled on his moody reappearance in Scotland. • To make sure viewers could understand what each Infinity Stone did, every time Thanos gets a stone, he uses it in the next scene. Much care was taken to show how Thanos uses the Infinity Stones. • When Thanos turns Drax and Mantis to cubes and ribbons on Knowhere, it was a nod to the Jim Starlin’s original Infinity Gauntlet comics, where Thanos does similarly weird things with his powers. • Setting the finale in Wakanda made narrative sense for a bunch of reasons (it’s hidden, Shuri is brilliant, etc. ), but it wasn’t considered a home run when the production team first made the decision. But then Black Panther became a mega-hit and now, it looks like a very smart decision indeed. • The writers found it difficult to figure out how Peter Parker would get aboard the spaceship in the film, so his first appearance inside the ship was completely reshot. • Everyone struggled with how to play out the Ebony Maw/Tony Stark fight aboard the spaceship to save Doctor Strange. There were various different iterations but, eventually, it was deemed too much. So, in another nod to Raiders of the Lost Ark, they decided to just cheat and have him get sucked out into space, much like when Indy pulls a gun out to win a fight quickly. • In another deleted scene, Star-Lord is understandably bummed that Gamora was taken by Thanos, and is listening to “New York Groove” by Kiss on repeat. Drax can’t take it anymore and turns off the Zune. The two Guardians get into a fight, when Peter suddenly realises Drax has been oblivious to a blinking light which indicates 20 secret messages have been sent to them while they were just sitting there. The messages, all from Nebula, tell them that she believes Thanos is taking Gamora to Titan. 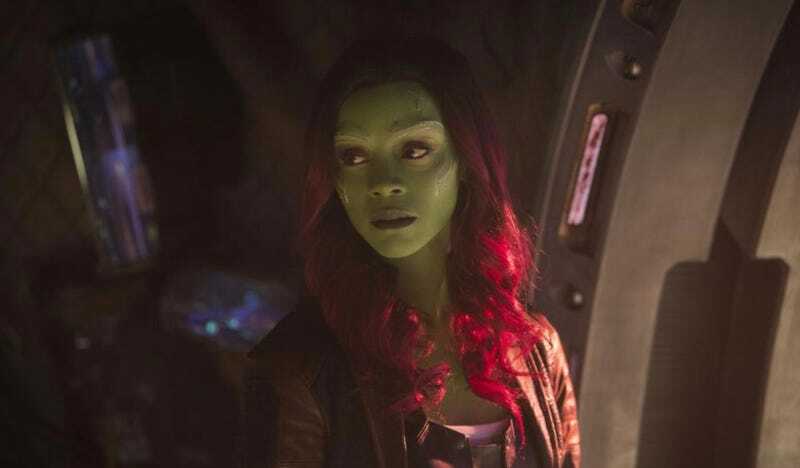 Gamora had even more to do in other versions of the movie. 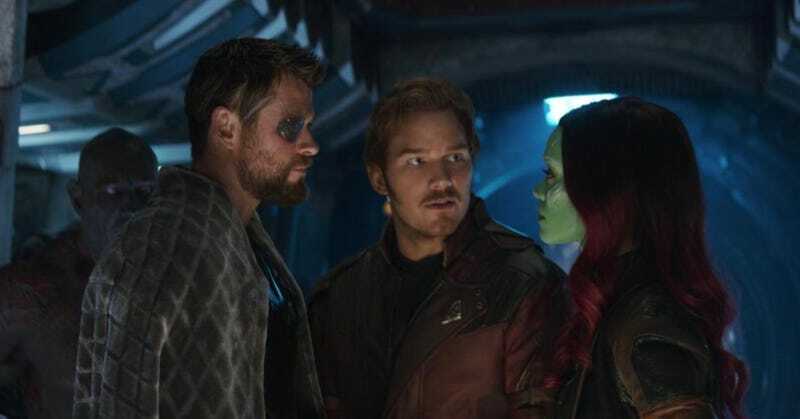 • The scene where Thanos tells Gamora he knows she lied about the Soul Stone was also shot twice, with the briefer version used in the film. A deleted scene release shows a bit of the longer version, in which Thanos uses the Reality Stone to show a younger Gamora returning from battle in the name of Thanos. He also tells her he let her escape. • Many people ask why Thanos didn’t go after the stones earlier in the MCU timeline; the reason is, he didn’t know where the Soul Stone was. So it wasn’t until Nebula tried to kill him, got caught, and let it slip that Gamora knew its location that he started collecting them in earnest. • There was much discussion of how Thor’s new weapon, Stormbreaker, would be created. They considered dragons and other things but eventually decided to use Eitri, the King of the Dwarves, and have him been forced by Thanos to make the Infinity Gauntlet for him. This tied the scene back to the main storyline, and was another reminder of Thanos’ power and brutality, since the Titan killed everyone in the realm of Nidavellir but Eitri. • The reason the Red Skull was brought back for Infinity War is they needed someone on the planet Vormir to explain to Thanos how to get the Soul Stone. Besides, the villain never technically died in Captain America: The First Avenger, and he was the earliest character in the MCU who was obsessed with the stones, so it felt like a good fit. • When filming the battle on Wakanda, Black Panther was still in production, so the directors had to ask the actors what their characters would chant on the battlefield; they didn’t realize T’Challa screaming “Wakanda Forever” would end up feeling so powerful. 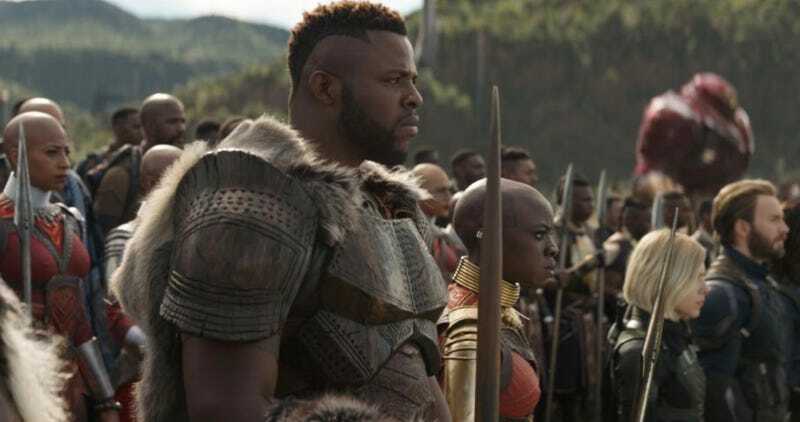 Winston Duke helped the Russos figure out Wakandan battle cries. • Most of Infinity War was shot at Pinewood Studios in Atlanta, Georgia, but the outdoor scenes on Wakanda were filmed on a ranch outside of the city. The team imported plant life native to Africa and created an artificial river that pumped 30,000 gallons of water per minute. • Rocket Raccoon refers to Thanos’ army as “space dogs,” which was added in after someone in an early test screening of the film called them “space dogs” on the score sheet. Everyone thought it was funny and added it in. • There were 70 Wakandan warriors as extras on set who were digitally extended to about 500. They were up against about 10,000 aliens. 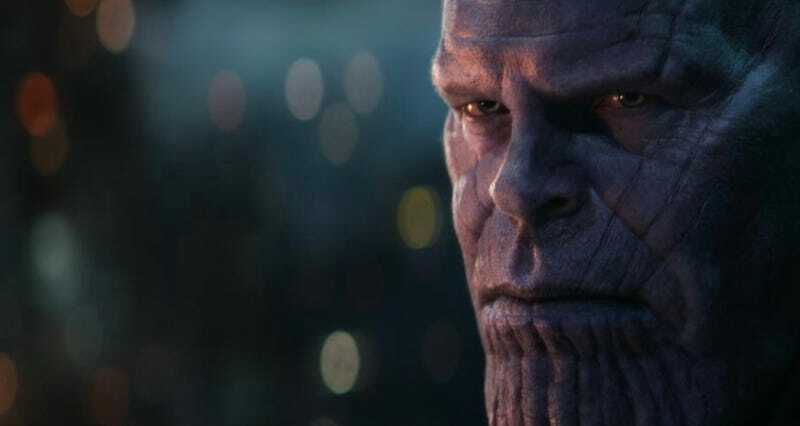 • Several drafts of the script had more of Thanos’ backstory and more scenes set on Titan at its peak, but they were all cut. • Because Thanos is so powerful, everyone had to figure out a way that the heroes could hang with him for at least a little while. They decided that Thanos had to make a fist to use a stone’s power. So with that rule in place, the heroes just have to stop him from making a fist to fight him. Power Stone? Check. Space Stone? Check. 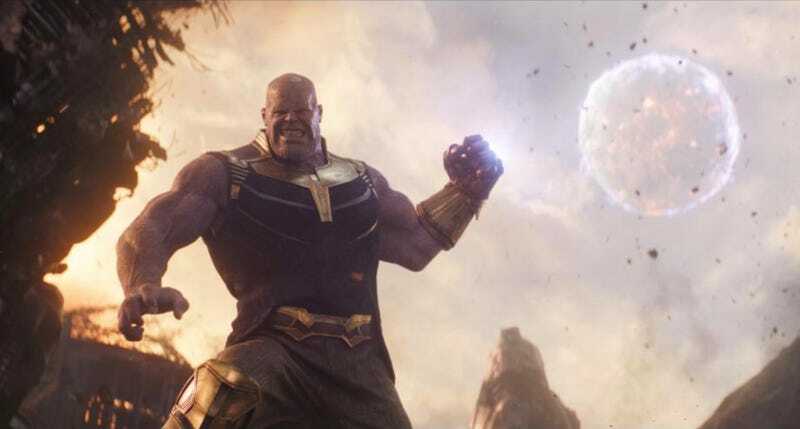 • To hurl the moon on Titan, Thanos uses the Power Stone to grab it, and the Space Stone to pull it. • Captain America will have a much bigger story in Avengers 4. • Tony’s latest Iron Man armor uses nanotechnology, and is thought to be the pinnacle of his design and powers. • After the snap, Thanos does in fact go into a dream state created by the Soul Stone, and encounters a “spiritual representation” of Gamora. • There’s a scarecrow of Thanos’ armor outside his bungalow at the end of the movie. It’s on the right of the frame, glimpsed very quickly. • The final tag was saved for the very end of the credits because they wanted the audience to sit with the sad ending as long as possible. Avengers: Infinity War is available for digital download on 20th August. It’s on Blu-ray 3rd September.